The Autobot military strategist is a critical part of Optimus Maximus. If his strategic skill can successfully combine with the courage of Optimus Prime, it would make Optimus Maximus almost unstoppable in battle. Prowl has been a steady presence in most Generation 1-type media from the beginning. Prowl met his demise front-and-center (as did most Autobots) in the 1986 movie, but his character lives on in other Transformers media. Recent G1-faithful incarnations have taken place in the IDW comic lines; the Combiner Wars is a 2015 multimedia event that crosses over between the toy line and comics. 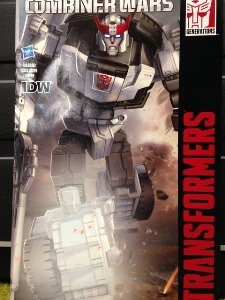 This version of Prowl is a character in the IDW story line. I've never really had much interest in the G1 cartoon version of Prowl � he never struck me as an endearing character. A while back I had the opportunity to read through some fairly recent IDW story lines (courtesy of my local library) including Robots in Disguise. I won�t go into detail, but the parts I read culminated in Prowl becoming part of Devastator for a short period of time. The story left an impression on me, and for the first time, I actually had some interest in the character. The only Prowl toy I have ever owned was the Universe (Classics) version. That toy was OK � and looked very much like G1 Prowl � but the mold was fiddly. I had heard issues with stickiness of the door paint and problems with the ankles � neither of which my particular figure had. But the design was poor in my opinion, so I sold him off a while back. 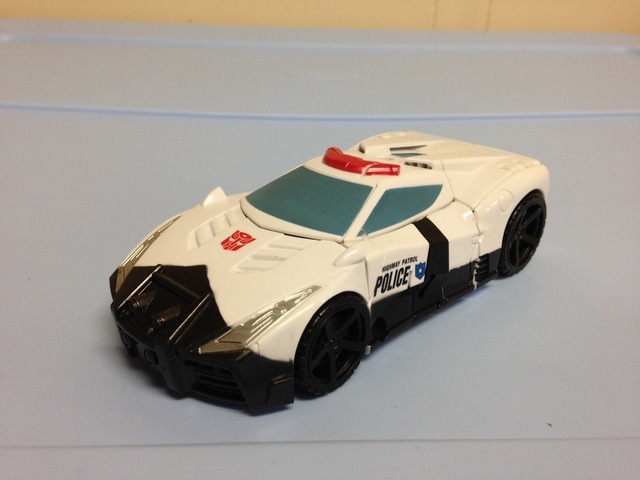 With my renewed interest in simple and fun Transformers, Prowl seemed like a no-brainer. While not the definitive version of the character, nor one the best Transformers I have ever owned, I�m still pleased with my purchase. Prowl�s alternate mode is a modified version of a R35 Nissan GTR. The car mode is sleek, yet sturdy, well detailed, and all the robot parts are hidden. The coloration of the car mode is done well � I was surprised how bright the white plastic is in person. Black with metallic flake adorns the sides and hood - it�s a subtle but well used paint effect. As is tradition for Prowl, Highway Patrol Police is proudly displayed on the side of the car with a small blue chevron and star. A red Autobot symbol is displayed on the hood, and a red light bar can be found on the roof. Windows and windshields are done in a metallic light blue. The headlights are done in silver for a bit of contrast. Overall, there is enough detail against the bright white to make Prowl stand out on a shelf of Autobot cars. As for functionality, the wheels roll smoothly, and Prowl�s robot parts are tucked away well enough to facilitate good car movement. 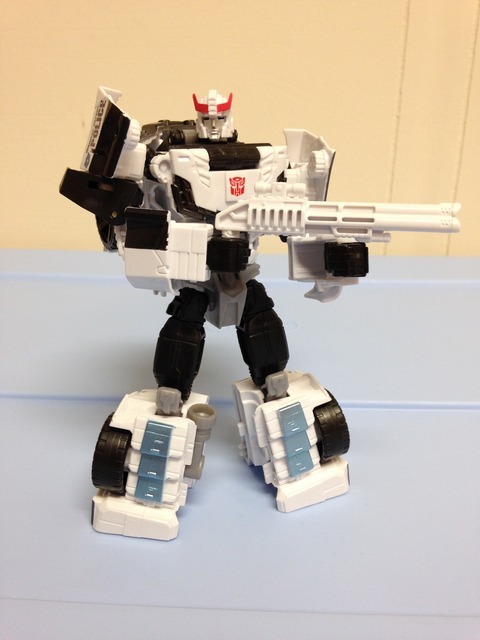 The included gun (molded in bright white plastic) and combiner hand/foot/weapon (decorated in grey plastic with silver paint) can be pegged into the top and lower sides of the car via 5 mm peg holes. There isn�t much else to do with the car mode, but it�s clean, bright and gets the job done. In the end, surely doesn't detract from the overall figure. As is with most Combiner Wars figures, transformation to and from robot mode is quick, simple, and fun. There�s nothing there to shock you, and I didn�t need instructions at all going between the two. The hood (and part of the top of the car) folds onto his back, the arms easilt pull out, and the hands swivel out nicely on ratcheting (resistive) joints. The legs open up from the bottom side of the car where they can be straightened and re-closed. Twist the waist 180 degrees, and Prowl is ready to go. Prowl marks the third time this mold has been utilized (Dead End and Streetwise preceded Prowl, Smokescreen succeeded Prowl for a fourth use), and if you�ve had the previous two versions, you may be tired of seeing this mold. As far as I can tell, the only update for Prowl from Streetwise is a new head � which is done really well, and I prefer this head to the Universe version. Otherwise, it�s fairly obvious this mold does not fit Prowl, nor does it do his Generation 1 style any justice. If you consider that Prowl may be a sort of �re-scan� version for the Combiner Wars story line, the visuals are suitable. If that doesn�t work for you, CW Prowl isn�t going to win you over. Aesthetically, Prowl has the markings of his traditional look � bright white, stark black contrast, a bit or red and silver here and there. I feel the head mold is spot on, but that's it. You won�t find a car hood/front chest, or doors that act like wings in the back. The paint apps on the chest are done well enough to mimic this, and the shoulders stick up enough to mimic the wings, but it just isn�t the same. Don�t get me wrong, I like CW Prowl�s looks just fine � I can confidently say I like him better than my old Universe version. But if you�re looking for a dead ringer for G1, keep looking. 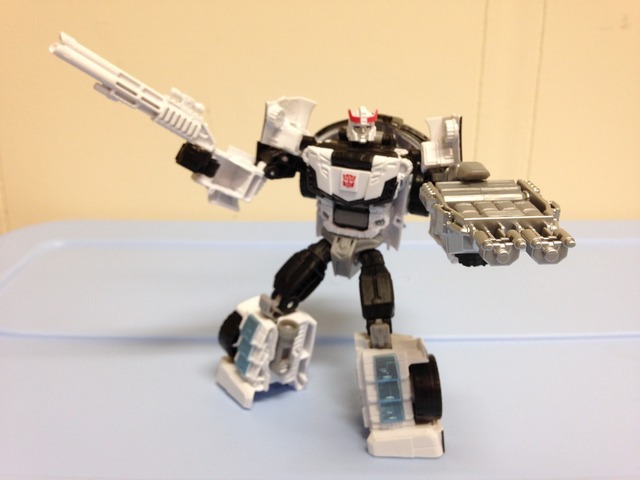 If you�re satisfied with CW Prowl�s look (like I am) you�ll be pleased to know that his paint apps are crisp and well done and any decorative symbols are tampo-style and clean. Articulation and balance are well done with this mold. I was worried that he would be quite back heavy just by design, but the feet are big, the joints are tight, the hood is hollow, and he�s got enough articulation to accommodate weight distribution. Prowl stands nicely straight up, and you can shift his weight well between positions and have him still stand. You�ll find a good range of motion all over, save for some bumping of the shoulders into the car parts on his back. He�s got standard articulation in the shoulders and arms, as well as hips and knees. Overall, he�s sturdy and the joints are tight. For a combiner part (arm or leg), Prowl gets the job done. He�s not amazing at any of it, but I think it works. There isn�t much to expect from being a leg (he�s mostly just an upright car with a peg on top) but I think he�s more suited as an arm, personally. Intended to combine with Battle Core Optimus Prime, Sunstreaker, Ironhide, and Mirage, Prowl makes the fifth Autobot for Optimus Maximus. It works well enough, and Prowl can be used in any Combiner, as is the hook for the Combiner Wars subset. CW Prowl won�t win any awards, and he�s the third use of this mold so far. If you�re feeling repaint/retool fatigue from the CW line, he�s not going to save you. But if you don�t have much experience with the CW line, you�ll find a fine figure here. Transformation Design: 7 Same as Dead End, Streetwise, and Smokescreen. It�s simple and quick, and in the end, it�s just fun to go back and forth. Durability: 9 Prowl feels sturdy and good quality all around. Fun: 7 As a standalone, he doesn�t offer much. But he looks good, and if you plan on using him in a combiner, I think there�s quite a bit of fun to be had. Aesthetics: 7 He�s not the best looking Prowl ever. But he�s sharp, the plastic is bright, and the head mold is great. Articulation: 7 Pretty standard for a CW figure. Won�t blow you away. Value/Price: 6 At MSRP, and as a standalone, Prowl is too pricey. On discount and used in a CW collection, this number goes up a tick or two. Overall: 6 I like Prowl a lot more than I anticipated. He�s good in a combiner, quick to switch back and forth, and just plain fun. If you bite, you�ll get a solid toy. His best feature is that I can easily use him when interacting with my son and his Rescue Bots � if that�s the way you plan to go, you can�t go wrong!